GuideStar Platinum? Really? Wait a minute. Hold on to your britches, Rich, not so fast! Where does ABIM's 2016 tax form say they are domiciled? It says they are legally domiciled in Iowa (IA). Right? Search for ABIM on GuideStar in the state of IOWA. Click on "Iowa" for legal domicile and type in "ABIM". The search comes up empty. "0 entries found." That is where they are legally domiciled. Why does it come up empty? What kind of scam or ruse is this? Try this again on GuideStar for some more "platinum ABIM results". Under state select IOWA, then type the words "American Board of Internal Medicine". Two entries appear and neither are the American Board of Internal Medicine. Instead of ABIM, the closest thing we get is the "American Board of Certification". Look at American Board of Certification's tax form. Its legal domicile is Iowa (IA). That's also how the domicile reads for the ABIM's IRS 990. ABIM's not platinum after all. Under legal domicile the ABIM's tax form says IA. So for platinum or even stellar results, one would expect accurate and honest linkages on GuideStar to the ABIM's legal state of domicile. But for reasons we understand better every day, the ABIM is neither accurate or honest. Searching ProPublica's "non-profit explorer", nothing came up for Iowa under "ABIM" or spelling it out. It's the same thing for the ABIM Foundation. Nothing comes up for Iowa, even though at the end of June 2014 on the ABIM Foundation tax forms, they falsely claimed legal domicile in Iowa. They also falsely claimed incorporation in 1999 in June, 2014. June 2015's filing: the incorporation was still 1999, but subsequently under scrutiny from forensic auditors and journalistic investigation the ABIM CFO changed the Iowa domicile to Pennsylvania, the correct place of incorporation. Iowa domicile was chosen most likely as a deception, because they have lax tax laws in Iowa. By June 2016 the ABIM Foundation claimed domicile in Pennsylvania. But oddly they were lying about its age. The Foundation was really ten years older. It had a 1989 incorporation not 1999. This false reporting opens up several cans of night crawlers when ten years of existence comes up missing. Especially after they illegally netted physicians money and put it into their hedge fund "hatchery" using the money to pad their incomes and attract more money for donations to conduct lucrative corporate projects hand in hand with their mischievous political agendas. And just where are those ten years of ABIM/F tax forms? The ABIM should post them for full disclosure. GuideStar is just a "dumb algorithm". Whatever is programmed in gets spit back at you. GuideStar does not have any forensic mechanism to detect fraud or inaccurate information. The ABIM provided inaccurate data and this shows dishonesty on their part. What was "disclosed" to the states and feds and then GuideStar is just plain wrong any day of the week. Otherwise when you search in Iowa for the ABIM, this testing corporation would show up. It is clear from the research so far all these tax "error" have to do with evasive maneuvers related to the same subjects discussed here coming under the headings "obfuscation" and "lack of transparency". A PLATINUM rating with guide-star? What a stretch. In fact it's embarrassing. Dr. Baron and his gang of derelict executives failed to do simple due diligence before they put up their false advertisement of transparency. It's a pattern there at the ABIM to leap before you know. In fact, they have a history of energetically stretching and coloring science and finance as if it were play dough. To say that the ABIM is transparent is like saying that Bernie Madoff or Jerry Sandusky went the "extra mile" on behalf of their clients. Sorry, the verdict is in: they cheated and harmed. It was a fraudulent financial pyramid scheme; a self-dealing political empire of mammon and lust erected out of immoral flesh and bricks of dust. You can say that you would just retire before you were pushed into that but why do you think you're not going to be on a kill list? A NY times article about GuideStar states that GuideStar does not evaluate or qualify anyone. If you want to explore a charity/non-profit by rating the NY Times author recommends "BBB Wise Giving Alliance". Another organization they recommend is Charity Navigator. FYI neither the ABIM or ABIM Foundation does not appear in their database of charitable organizations or has not been rated! "One of the first stops in searching for charities is GuideStar, which contains records from 1.8 [2.2] million nonprofits registered with the Internal Revenue Service. The free component of the GuideStar website provides access to each organization’s Form 990, the basic I.R.S. filing document for nonprofits. That is useful on the front end if you want basic information on a charity’s income, spending, mission and executive salaries. As with the other services, you can also pay for “premium” services from GuideStar that provide more financial analysis and access to a nonprofit’s contractors. This would help if you wanted to perform detailed comparisons of charities or to explore their financial ratios or executive compensation in greater depth. What GuideStar does not do is give a qualified rating of a charity. It tries to remain neutral and “is not a charity evaluator,” says Lindsay J. K. Nichols, a spokeswoman. For more intensive evaluations, you need to go to the BBB Wise Giving Alliance or Charity Navigator. The BBB Wise Giving Alliance, affiliated with the Council of Better Business Bureaus, has free reviews of 1,300 national charities; local BBBs have evaluations on an additional 10,000. The group applies 20 “accountability” standards — governance, oversight, effectiveness and the like — once every two years at no charge to the charities, but it does not explicitly rate them using a star or letter system. Organizations accredited by the alliance can then pay a sliding-scale fee based on their size to obtain a license to use the BBB Charity Seal on websites and fund-raising material. About 60 percent of those qualifying elect to pay the fee for the seal. Still, the group’s focus on audited financial statements and accountability — it also publishes in-depth newsletter articles on the subject — is a pragmatic way to view a charity’s operations." CNN ran a controversial story stating that the Clinton Foundation received a "platinum rating" from GuideStar, which was a false assertion as the organization does not rate anyone. A writer/journlist responded to this assertion calling it "fake news" and gave some pertinent background information about GuideStar. Is ABIM also selling false or fake news to the public? Based on what GuideStar has to say about itself, and what the ABIM has implied on their website tweets (that it has been received "platinum status" by GuideStar) is simply not true. So perhaps Dr Baron, or whoever tweeted it to the world, should take this false and misleading statement down and apologize to any patients and physicians who were misled. "In an email with Jacob Harold, the CEO of Guidestar, he stated , “We do not endorse candidates or political parties. GuideStar is a neutral data platform. We do not consider ourselves a watchdog or a ratings agency. “Guidestar has, however, created the “Platinum Seal” program, which allows a nonprofit to submit any metric they like, whether they choose one of the 700 metrics already listed or can simply make up their own custom metric. Some of these metrics are as simple as “number of donors” or “number of first time donors”. This is analogous to our trusting those in our DC institutions to proceed honorably in their legislative agendas and regulatory oversight while we put our heads down and worked our respective occupations. Turns out that trust and lack of actual transparency has lead to a government that has separate benefits medical coverage pensions from the "regular" citizens and has created an Elite class that cares little for US citizens sovereignty of the country or health of the economy except where it benefits their special interests. The call should be for more prudent "regular" citizen oversight and dependable information from neutral sources so we can have real transparency. Our free press and Federal Government have failed our expectations. It is time to say, "it's never too late to be active in recovering our rights to self government and assurance that our voices are heard." We agree with RC completley! Lisa is right about ABIM "International". ABIM is going global and has had activities/income overseas for several years. The abandoned ABIM trademark shows us their thinking in this direction. The scrutiny the ABIM has received may have forced them to go through ABMS International for its financial cut of the cert. pie, and so on in their global expansion. According to their tax forms ABIM receives money from ABMS International for services rendered. They are also - among the "other things" they do - pushing "inspiring innovations", which means more passionate talk and ideologies to sell tech innovations to increase monitoring, reporting, and introduce/expand EHR and cost saving/life saving software programs as the critical components. All lucrative deals whatever they are. Christine Cassel's company Premiere (stock shares) should gain from this overseas expansion. ABIM's recent tax returns show more payouts to CeCity. (More proof of the ABIM supporting healthcare industry giants to just get bigger and bigger. Bob Wachter's hospitalist legacy and financial partnerships will grow and prosper from this. We get zero disclosure on all this, these "other things" and secret deals we learn about later. IHI's Don Berwick and ABIM's famous former "cover-boy" Robert Wachter are promoting American quality assurance cartels like the ABMS and ACGME internationally. And they are selling tech and costly innovative "B to B" programs to spur cost savings for the corporate elites under full protection of the "home office" and "state department". Monitoring waste? Penalizing it? Getting health workers to "innovate" as a populist motivational ploy? Universal coverage? 22 billion dollar cost savings for the NHS to promote it. Whatever they are doing it is hard to keep track of the extent of it. But the questionable inspirational and sensationalist themes are essentially the same wherever they go. Berwick and Wachter both push "love", "honest doubt", and "only you can do it" approach as the great "inward teachers and motivators" that will help their audiences buy into corporate innovation. Generally this means healthcare spending reductions from both private and public insurers to save money coupled with calls for an increase in spending for vital innovative programs and tech roll outs. Imagine a big corporate machine with cogs within cogs and a small handful of people who will prosper when all the workers and expenditures fall in line and you will have a closer definition of this Orwellian concept of love that drives the corporate universe. But there are people who tell the truth and ultimately the "inward teacher" of love is found out to by only passing emotion. This realization occurs after one discovers their real force of love has been spent on liars who manipulated them. Compassion spent on pretenders. Love usurped and superseded by a cunning rigid regime, that inspires not out of real love, but out of desire for strict control in order to serve elites with insatiable financial motives and interests. The Wachters and Berwicks of the world have mixed motives for being in Qatar and the UK respectively, however. What is it? Front men for special interests; global political ideologues working for government and corporate ventures simultaneously?! Berwick makes errors, though. In Qatar, for example, he tells his local and international audience to reach for the branch on a tree in a land of palm trees, rocks and a lot of sand. He lost the locals in the front rows in 2015 at Doha's "innovation conference" also when he pimped his grandchild using Leggo toys as a teacher of healthcare innovation. Berwick is mostly air and they knew it, but a well-placed bag of air at the time. For Robert Wachter fans, Bob had to sell his "love" theme vigorously before his trip to the UK to promote US electronic medical record technology to the British. Bob had something big to hide. His company was in the courts accused of systemic/pervasive corruption involving multitudinous acts of medicare fraud. The DoJ did not even have the resources to look at the other states that IPC, The Hospitalist operated in. Love may have been just the ticket for Wacther, because of his unexpected exposure to the fraud case against his company IPC - "The Hospitalist" via the writings of a journalist/triple-boarded physician who maintains this web site. Wacther received some very lucrative stock dispensations, a rich annual compensation, and monthly stipend for his "safety chairmanship" and his enthusiastic labor of love in selling a very aggressive business model to UCSF geting IPC on the curriculum for "insurance" in helping to keep the IPC fraud storyline out of th press. But primarily insurance to keep the DoJ from expanding their investigation to include individuals like like Wacther and the CEO of IPC. Spreading the risk around to UCSF was just the medicine needed for Wacther and IPC. He earned his stock and hundreds of thousands of dollars! Atta boy, Bob! Bottom line is we received no informed insights from our media or from the ABMS/ABIM. And we still get no disclosure about any of the alleged payment/bonus incentive fraud schemes at affiliated companies that CEO and other executives have egregious conflicts of interest with. IPC "The Hospitalist Company" is an excellent example. Companies, like Wachter and Cassel worked on behalf of, served themselves up bigger heaps of medicare/federal money, while at the same time the ABIM, Chris Cassel, Richard Baron and board chairman Bob Wacther were pumping up internists to be super specialists in "hospitalist medicine". Conflicts of interest? Government fraud and corporate corruption of the worst kind? No real studies have been done to measure the cost and harmful effects that Wachter's innovative movement (which he financially benefited from) versus traditional uses of highly qualified internists and specialists to make rounds on patients (many of which are their own patients) in hospitals. Questions were tossed around, but where are the studies showing we are better off with big corporate medicine. Options for patients are drying up. Physician shortages loom as an indicator of social health - a precursor warning us of increases in morbidity, not declines. The case was first filed in 2009, with the DOJ filing in 2014. The allegations and lawsuit covers the time of tenure at the ABIM involving the initial allegations of fraud by a whistleblower. It is very unclear what ABMS/ABIM are doing with the ACGME and Joint Commission in other countries. But it is very troubling to see what they are pushing and where they are pushing it. And who is doing it with them. For example Don Berwick of CMS controversy/fame and founder of IHI is on the radar when there are battle brewing in healthcare. Berwick is on the advisory committee for Hamad Medical Corporation, which is the government medical services in Qatar. The ABMS/ABIM, ACGME, and Joint Commission are working with Qatar's ruling regime pushing their healthcare agendas. And it appears to be financially motivated, politically charged, and has all the hallmarks of being driven by special interests. Qatar is a region in the news a lot lately, known for its abuse of massive worker population who live in labor camps. What a healthcare crisis when over three-quarters of the residents of a country are not citizens. They live without a vote in anything and reduced rights. The conditions are horrendous and the human rights violations remind one of horrors out of the past. At the same time the Qatar regime harbors radical terror groups/individuals and worse -- they provide support to ISIL and other terror organizations. Don Berwick and IHI (who had a very close relationship with NQF and Denham) were implicated as were many others like Janet Corrigan who resigned from the NQF before being disgraced. ABIM's current CEO, Dr. Baron was board director at NQF during the years the scandal was brewing. There was a concurrent scandal at the ABIM as well and Baron was "chasing zero" with competing board review competition. He zealously worked to allow zero competition with the ACP MKSAP/review program and growing financial relationship with the ABMS/ABIM. Christine Cassel and Bob Wacther can be implicated for more than turning a blind eye, but even working with their connections to help cover-up as much as possible of the NQF's political/financial shenanigans in relation to their own revolving door involvement and those connected with the NQF/AHRQ/HHS/CMS/TMIT/HHI and Chuck Denham's safety media empire. Chuck Denham got a million dollar slap on the wrist for and no jail time. Why? Too many people were implicated in public and private organizations as were hospitals across the nation. Any deeper investigation of the corruption at so many related organizations would even reveal a global connection to corporate crime/kickbacks involving WHO and even the CDC. The DoJ had no resources and certainly no appetite for that. ABMS/ABIM/ABP, Joint Commission and ACGME International - what are they up to? The "CFO" of the ACGME, Mr. John Ogunkeye who is doubling as Senior VP of ACGME International, appears to be more of a digital health record salesman and healthcare technology broker than anything else. He was hired to fill a key position at John Hopkins just when they were about to switch over to EPIC. They stated in a press release that that was his major role for the coming year when JH hired John Ogunkeye in 2012. He was chosen because of his past tech experience installing an EHR at Jefferson in Philly. "Ogunkeye will oversee the CPA and aid in the vital implementation of Epic, the new electronic medical record (EMR) system for Hopkins Medicine and the CPA. "Ogunkeye brings to Hopkins not only top-notch clinical administrative and management skills and a track record of success, but also a new vision," said William Baumgartner, M.D., president of the CPA and vice dean for clinical affairs at the Johns Hopkins University School of Medicine." A little over a year later Ogunkeye went over to ACGME and ACGME International in 2013 as their global expansion was ramping up. It appears that education is a secondary business for the ACGME and their partners at the ABMS. With the US under a firm ironclad rule, the ABMS and ACGME, along with many of their MD investment brokers, are putting their focus on despotic countries abroad and forgetting their core fundamental mission at home. Ogunkey is paid over 600K for his services. Physician assisted caning in Singapore. Where is Drs. Baron and Nora's outrage? Where are Drs. Holmboe and Nasca's statements of condemnation? The ABMS International, ABIM, the ACGME International, and the Joint Commission International operate in Singapore, Brunei and elsewhere where physician assisted caning takes place. It is a form of torture and an injurious act beyond belief. Please do something to help change this. These influential quality assurance organizations and their powerful executives from the United States know about this heinous barbarity, but they have done nothing to help prevent it. They have not made any public statement opposing this criminal form of punishment. Why? Can someone please tell me? Prison caning graphic must be 18 years or older. Why aren't they addressing damages caused to physicians by the ABIM MOC program? I watched the 2016 ACGME "physician well-being symposium" lecture on burn-out. The speaker spoke about high numbers of physician suicides - highest rate for a profession in the country. Over 400 documented physician suicides per year. Higher female to male ratio. The speaker made a bad joke/inference that "women are high achievers" in relation to follow-through of taking their lives, thus the higher stat. This did not sit well with me because we have first-hand family experience with the tragedy of suicide. The pain does not go away. The eroding conditions for men and women who devote their lives to heal and ease the suffering of others and why it is happening needs more study; but not the superficial kind that the JAMA, ACP annals, Medscape, ABMS and the ACGME are touting. It is astounding how insensitive the government bureaucracy is in pushing political/corporate agendas and how sterile and rigid the corporate and academic milieus can be in confronting burnout/depression/suicide. I get the sense that the ACGME is whitewashing their underlying contributions to the misery of physicians from the point a student enters medical school. The ACGME is glossing over as well the place that MOC has in all of this. Pretty pictures of diverse professional actors/models playing physicians most likely serve a purpose. However, it is not just about being tested to death that the ACGME and ABMS are not addressing, but also about how the whole artificial and arbitrary quality improvement/testing system has become. This quality/testing/surveillance "system" has grown like a disease. Like a virus out of control. The ABMS and MOC are now powerful and potent enough to destroy both the doctor and the patient. It is killing its hosts. Unfortunately the best witnesses to this fact who can tell us and our legislatures how life-destroying failing ABMS' bogus voluntary tests can be are dead. Look at the stats. Burnout rate is up 12% to 63% in family practice. Up in all the specialties, except surgery? Go figure. The lecturer went over causes of burnout, but the simmer of pain would not let me listen with the enthusiasm that the speaker would have liked had I been a live participant. I would not have been invited anyway. It was a pleasant family practitioner who gave the lecture after someone spoke about MACRA and I presume other burdensome bureaucratic requirements (I did not see that portion of it). The FP did not discuss MOC specifically, and I could not see the audience, but from photos of the event it looked highly selective symposium held at ACGME's Chicago suite. Nothing will be solved unless people really get their teeth into the problems associated with burnout. One must be completely honest about it and put aside the addiction for power and money. MOC should be the first of the useless and destructive contributors of burnout to go. It is literally a killer. Physicians and legislators fought back and their voices were heard by the government. We understand the physician opposition was strong. And the ministry realized patients would suffer getting the short end of the stick also. It is unclear if the president intervened when he heard about the opposition. According to doctors in Russia, the Ministry of Health has reversed the new national mandatory MOC policy. As it stands now the new five-year "mandatory MOC" testing for all physicians in Russia has been changed to be completely "voluntary". There was no time or money for it. It was a wasteful proposition. Physicians have choice and freedom to tailor their own CME in Russia again. Are Russian physicians and docs in the EU more enlightened than us in America? Are Russia and the EU more democratic or did they just sensibly realize mandatory MOC would hurt their healthcare systems dramatically -- which it certainly would do as we see happening here in America from the ABMS'(and special interests) violatory actions against physicians and patients. There is nothing transparent about Wachter's account of the "first safety scandal". It was all a spin as was Cassel's "statements of cooperation" with the DOJ, Pro-Publica and Senator Grassley. The DOJ false claims whistle blower lawsuit settlement against Chuck Denham is intriguing and makes one a skeptic about the thoroughness of the DOJ ore their desire to pursue all the criminals. The DOJ settlement announcement fails to mention that Dr. Denham, while working as Co-Chairman of the NQF Patient Safety Committee made expensive media commercials/webinars/movies on behalf of the NQF presumably at his own expense. His NGO's [HCC/TMIT] paid donated to NQF close to three-quarters of a million. Denham's film "Chasing Zero" was sponsored by the manufacturer of ChloraPrep Cardinal Health/Care-Fusion and features the NQF CEO Janet Corrigan, who resigned in 2012, and it also features prominently the IHI founder Don Berwick. There is also a sequence of interview segments with the AHRQ director/editor Carolyn M Clancy (resigned in 2013). Bob Wachter through a contract with AHRQ and UCSF has worked as an editor for the HHS subsidiary AHRQ. A very important bit of information also is about Don Berwick who was forced to resign from various positions to become head of the CMS in 2010. Chuck Grassley sent Berwick a request for conflicts of interest response letters. 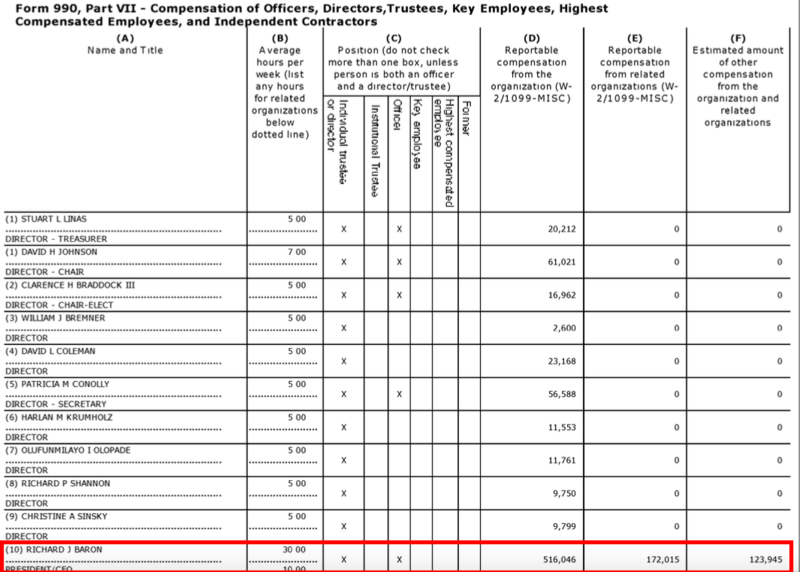 Berwick's non-profit NGO, IHI, which paid him deferred compensation 900K and healthcare coverage, received money from Cardinal Health (manufacturer of Chlora Prep) and Kaiser to name a few. It was not known at the time of the lawsuit in 2009 that Christine Cassel was on Kaiser and Premier boards. ABIM's policy advisor Ann Greiner (wife of a national union icon and healthcare insurance specialist) was sent over to the NQF to troubleshoot on behalf of the NQF's Corrigan/Cassel/Darling just prior to Cassel being named as the new CEO. There is much more to this story and Chuck Grassley knew it. The settlement egregiously fails to note that Denham received from the maker of ChloraPrep around 11.2 million in kickbacks. Nobody ever mentions where the money Chuck netted went. "United States Settles False Claims Act Allegations Against [NQF] Patient Safety Consultant [Dr. Charles Denham] and His Companies [HCC, TMIT]"
"The settlement resolves allegations that, under agreements entered into in 2008, Denham received monthly payments from CareFusion Corporation while serving as the co-chair of the Safe Practices Committee, which reviews, endorses and recommends standardized healthcare performance measures and practices. The United States contended that Denham did not disclose to the committee, or any other individual or component of the National Quality Forum, that he was receiving payments from CareFusion. The United States further contended that Denham solicited and received these payments in exchange for influencing the recommendations of the National Quality Forum and for recommending, promoting and/or arranging for the purchase of CareFusion’s product, ChloraPrep, in violation of the Federal Anti-Kickback Statute. The United States alleged that this conduct caused the submission of false or fraudulent claims for ChloraPrep to federal health care programs." General McChrystal is on the board of Siemens government technology and "Knowledge International" an arms deale tied directly to the United Arab Emirates. Siemans has large government contracts in the globally including Simens US and in the Middle East. UAE is a large buyer. Siemens makes medical equipment. Don Berwick is an advisor to Hamad Medical Corporation in Qatar/UAE where General McChrystal was based during his Iraqi operations. Feely, IHI's, president is formerly NHS Scottish healthcare leader. Spear is a High Velocity business man. How appropriate is this and how transparent are they in their financial and political relationships? As was mentioned here, elsewhere and on their websites, the ACGME-I and JC-I have been actively accrediting educational programs and facilities in the above mentioned regions including Qatar and the UAE. ABMS claims to have financial and educational interests in these lucrative, politically sensitive and highly volatile regions. It was mentioned above that Hamad Medical Corporation, Qatar's government medical system, has financial and educational relationships with the ACGME, ABMS, and Joint Commission. How transparent are these Middle Eastern and North African relationships, or any of the international activities of the ABMS, ACGME, and Joint Commission? This is the first I have heard about it and it troubles me for a variety of reasons. It appears to be rife with the atypical conflicts of interest that demand clarification and a great deal of explanation to candidates, diplomates and taxpayers. hat's worse the political appearances are very concerning. Many of these countries are in direct conflict with our foreign policy efforts to fight terrorism. What is the thinking and justification for diluting the educational and financial resources of these quality assurance organizations? ABMS, ACGME, and JC tax records are not transparent documents, but have revealed the troubling creation of international satellite organizations without and real disclosure to the public or clients. It appears there are uncertain intentions and opaque relationships. The possibility for undocumented flows of money are characteristic of these regions for the purposes of political and financial influence. What relationship do these organizations have with corporate private or governmental interests? I believe we have the right to know why they are engaged there and to what extent have they studied the impact that such foreign involvement has involving the integrity and transparency of these organizations. Are these organization and their standards being degraded with the creation of a foreign mission and agenda? I am suspicious of the wisdom of such interventions in foreign healthcare systems when the variables for trouble are ripe with content. I do not believe the scant statements given on their websites disclose much at all other than the desire for exotic points of destination for executives to be distracted with or entertained by couple with flirtations with dangerous power structures and financially corrupt traditions that are not acceptable in our country and way of life. Are the Joint Commission, ABMS or ACGME not just playing with greed and political fire by pandering to despotic regimes well-known for horrific human rights records with well-documented violations? If not, then what are the real reasons for this foreign involvement? Who initiated this recent movement abroad and what motivates it? Doesn't it confuse standards of measurement here in the US when we accredit a medical system, organization, or individual physician in an entirely different context and inconsistent environment. Misrepresentation and murder on the ACGME/ABMS Orient Express? Did the ACGME and ABMS commit public fraud in Singapore when they introduced "Competency Based Medical Education" in 2009 as a US "practice" and not as an experimental "theoretical model"? Yes they did. At the time of Singapore's organizational makeover to CBME, the ACGME was without proper empirical evidence proving its efficacy according to CBME theory experts and even the ABIM's website where they only ready to launch their pilot programs starting in 2014. Eric Holmboe ABIM's CMO was involved in these pilot programs as he moved over to the ACGME to head the Milestones project - another theoretical model without solid proof of its value other than in-house ACGME reviews. The ACGME/ABMS "land of la"
Does the ACGME and ABMS really know what they are doing? It appears more and more that much of their programs and testing are based on "un-proven and untested theory. Look what the ACGME/ABMS did to Singapore in 2009 and still the CBME theorists and experts are arguing about the value of CBME today! The Singapore Ministry of Health with the ACGME altered the entire model of internal medicine residency and specialty training in just 18 months "mission accomplished" by 2010. How can this transformation of Singapore's GME be anything other than a social experiment on the populations of the sovereign Republic of Singapore, when it was not until 2014 and 2015 that the ABIM and ACGME were just beginning to conduct limited experiments in CBME? They were conducting pilots in order to gain some of the necessary empirical knowledge before introducing "Competency Based Medical Education" into US GME training programs. "What is the purpose of the [ABIM ACGME] pilots?" "Few experiments in residency redesign are investigating the feasibility and effectiveness of CBME. Furthermore, current beliefs and opinions about how training should be reformed lack an empiric evidence base to guide change. In light of this current situation, ABIM began to work with the educational community and a small number of willing Internal Medicine and fellowship training programs to pilot several different models of CBME. ABIM recognizes this will be a long evolution, with this first" phase of work lasting 4-8 years, and that participating programs will need support from ABIM and the educational community to carry out these pilots." "Did ACGME issue an official approval letter for the pilot[s]?" Participation in the pilot programs is made possible through ABIM-granted individual exceptions to training. As individual exceptions to training, the IM RRC has agreed that participation in these pilots does not require IM RRC approval." Abstract "Competency-based medical education theory to practice" bearing Eric Holmboe's name (ABIM CMO/ACGME Milestones Project) along with Canadian and European authors from 2010. ACGME-I/ABMS-I Singapore: In 2009 Singapore Rushed To Change Their "Traditional" Residency Training Model To A Competency Based Medical Education "Experiment". The educational model CBME was passed off as the "American" ACGME system when ABIM was still yet to introduce pilot programs/studies lasting up to eight years with waivers from the ACGME RRC. CBME "competency-based medical education" - all theory and little to no empirical data? ABIM's pseudo-scientific approach always begins with the bogus premise to validate the need for MOC and the underlying theory of "CQI" - "continuous quality improvement". CQI is based on the empirical ABMS/ACGME science of "cash-based medical education". "CBME"
"What are the requirements to propose a new [ABIM] pilot? 13. Propose a strategy for incorporating data from the continuous MOC* program to track the progress and performance of the pilot trainees post completion of the pilot program"
*continuous MOC = continuous "maintenance of cash"
"Drugmaker GlaxoSmithKline, which was slapped with a record $489 million (304.26 million pound) fine for corruption in China last month, said on Tuesday it was looking into allegations of corruption in the United Arab Emirates. Britain's biggest pharmaceuticals group confirmed the investigation following allegations of improper payments set out in a whistleblower's email sent to its top management on Monday. The email, purporting to be from a GSK sales manager in the Gulf state, was seen by Reuters. The company is already investigating alleged bribery in a number of Middle East countries, including Lebanon, Jordan, Syria and Iraq, as well as Poland."